Margaux grab bars feature the distinctive pillow-top detailing of Margaux faucets and accessories for an elegant, classic look. This 18-inch bar easily adapts to any bathroom, providing support for entering and exiting showers and baths. Traditional styling matches any decor. Coordinates with other products in the Margaux® collection. The Delta 12 inch Traditional Grab Bar provides leverage, support and stability for up to 500 pounds, exceeding ADA standards. The traditional style provides warmth and welcome with conservative and refined edges, and symmetry for a familiar and balanced design. With only 2-3 screws required for a secure mount, the five screw flange gives you installation flexibility to accommodate your individual grab bar mounting needs. The decorative flange cover fits securely over the grab bar flange, concealing the screws. Crafted from die-cast zinc and stainless steel for lasting quality and durability, and available in different finishes to reflect your classic style and dicor. The Delta 18 inch Transitional Grab Bar provides leverage, support and stability for up to 500 pounds, exceeding ADA standards. The transitional style provides elegant simplicity, combining traditional warmth and welcome with a sleek and modern touch. With only 2-3 screws required for a secure mount, the five screw flange gives you installation flexibility to accommodate your individual grab bar mounting needs. The decorative flange cover fits securely over the grab bar flange, concealing the screws. Crafted from die-cast zinc and stainless steel for lasting quality and durability, and available in four finishes to reflect your unique style and dicor. These units are highly recommended by barrier-free design experts because they provide the optimum approach path for wheelchair use. Consult applicable codes for specific requirements. Swing up bar is only as strong as the wall and anchors to which it is attached. Grab bar must be securely fastened to wall to withstand the load it is intended to support. Units must be secured and anchored to wall or approved carrier according to installation specifications by a qualified tradesperson. Mandrel bending process on all curves maintains uniform bar diameter. Grab bar is manually lowered to horizontal support position and raised for departure. A locking system enables the flip up grab bar to be locked in either a horizontal or retracted position. Tubing is either 16 gauge type 304 1-1/4" O.D. (outside diameter) stainless steel with exposed surfaces in polished satin finish or 16 gauge steel with white finish. 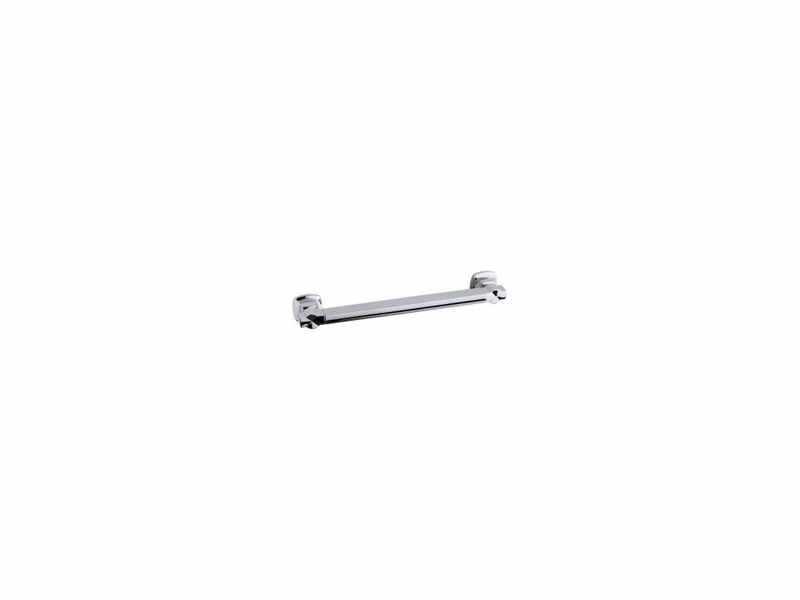 Margaux 18 inch X 1-1/4 inch Grab Bar in Polished Stainless Margaux grab bars feature the distinctive pillow-top detailing of Margaux faucets and accessories for an elegant, classic look. This 18-inch bar easily adapts to any bathroom, providing support for entering and exiting showers and baths.